This book provides invaluable support and practical guidance for those who are grieving. Focusing on uplift, it emphasizes the triumph of hope over grief. It touches the heart and spirit, revealing the mercy and grace of God. - Publisher ^ There is nothing more devastating than the death of a loved one. And whether it comes suddenly and unexpectedly, or at the end of a long and painful illness, every death is experienced anew, a shocking loss that takes our breath away and leaves us disoriented and lost. Grief is mysterious, misunderstood, and experienced differently from individual to individual, yet there are certain universal elements. In this compassionate epistolary handbook on grief, a pastor offers comfort and understanding to a man suffering a profound loss, showing grief as a healthy process that God can use to mend broken hearts. Revised and updated, this twentieth-anniversary edition features prayers and scripture meditation, as well as a new introduction and epilogue. Simple, profound, personal, compassionate ... "When You Lose Someone You Love" tenderly walks the grief-stricken through sorrow to peace and, eventually, renewed joy. About "When You Lose Someone You Love"
^ There is nothing more devastating than the death of a loved one. And whether it comes suddenly and unexpectedly, or at the end of a long and painful illness, every death is experienced anew, a shocking loss that takes our breath away and leaves us disoriented and lost. Grief is mysterious, misunderstood, and experienced differently from individual to individual, yet there are certain universal elements. In this compassionate epistolary handbook on grief, a pastor offers comfort and understanding to a man suffering a profound loss, showing grief as a healthy process that God can use to mend broken hearts. Revised and updated, this twentieth-anniversary edition features prayers and scripture meditation, as well as a new introduction and epilogue. 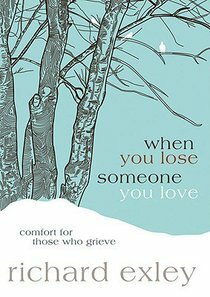 Simple, profound, personal, compassionate ... "When You Lose Someone You Love" tenderly walks the grief-stricken through sorrow to peace and, eventually, renewed joy. Richard Exley is the author of twenty-nine books, many of them bestsellers, most recently Man of Valor and Encounters with Christ. The Making of a Man was a finalist for the prestige's Gold Medallion Award. His rich and diversified background has included serving as senior pastor of churches in Colorado and Oklahoma, as well as, hosting several popular radio programs, including the nationally syndicated "Straight from the Heart." Richard and his wife, Brenda, reside in Beaver Lake in Northwest Arkansas.